Here we go again! 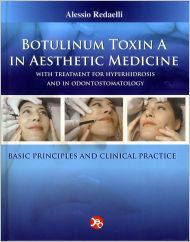 Another book about Botulinum toxin A! What can still be said, after the plentiful Italian and foreign books published, also lately, by important international authors? As a matter of fact, thanks to Internet and the globalization, it is certainly easier to take advantage of the experience of far-away authors. Botulinum toxin A, though, is the most commonly used among the substances today and clearly in greater evolution. Surely what I would have written a few years ago, and I've written, changed radically, and there is no doubt that the biggest changes occurred in the last two or three years. In particular, the treatment of areas until recently untouched and potentially dangerous, such as the perioral region, has opened new horizons, with results completely dependent on the technique, dosages and injection sites that must be absolutely perfect, to adapt to each individual patient. For this reason, the study of patients, their behaviors, and their facial mimicry has become crucial in order to obtain natural results and to avoid side effects that might be, sometimes, very bothersome. In this new book I made an effort to offer news and fields of interest also for old users of this technique, e.g. the study section of the facial musculature mimicry, where I tried to study the muscles in relation to their function, fully evaluating the mimicry in order to understand its evolution after treatments. In fact, with Botulinum toxin treatment, we shouldn't think of every single muscle, but the whole complex of the facial muscles that changes the reciprocal relations of forces, in most cases improving the aesthetics of the patients, but sometimes worsening it (think of the annoying and common to see "Mefisto look", due, in most cases, to such a preliminary evaluation error and insufficient study). I hope my effort may well be of help to all colleagues who daily, like me, have to face the difficult task of rejuvenate in "correct" and natural way their patients. As always I haven't spared the suggestions, those that I use daily, to avoid problems. And, as usual, I urge everyone to love modest results, sometimes insufficient but always increasable, and avoid instead results much more glaring but potentially unsafe. I always say in all my classes, the risk, if possible, should get closer to "zero", and or rather be "below zero".